I wrote this an article about how to automatically convert Malaysian IC Number to Birthdays five years ago. I was surprised that people recently commented that it didn't support those born after the year 2000. I'm responsible of putting the original information online so I'm obliged to update it if it didn't work. So here I am giving you the updated version. You can play with the excel sheet here to see how it works. The excel formulas that I used above are as below. 5 Reasons Why Manoj Vasudevan Won in 2017 and not in 2015? When ACS, CL Manoj Vasudevan became the Champion of the 2017 Toastmasters World Championship of Public Speaking, it generated a big buzz on the internet and social media platforms. Some people admired how well he spoke and how great his message is. Yet there are some that expressed doubts about the standard of Toastmasters. They wondered how could he won using a similar speech to the one he used in the finals of 2015 World Championship of Public Speaking? Curious about how true the allegation is and what I could learn from this spectacular win, I spent some time analyzing both speeches. With my limited knowledge, I speculated 5 reasons why he won the 2017 Toastmasters World Championship of Public Speaking and not the one in 2015. If you haven't watch the speeches, I highly encourage you to watch them below before reading the five points below. The New : Sugahut's Coconut Milk Plus DurianWhen I went to 7-Eleven today, I saw a very interesting new drink on the shelf. It is a coconut milk + durian drink. Intrigued, I bought one can home. After trying it, I deem that it is not my cup of tea. 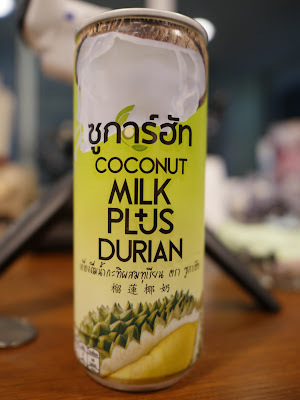 If you are a person who likes durian flavored soy milk, this might be the drink for you. Or if you are craving for something sweet after your meal, this might be for you too. The New : Feature Creep and What to Do About it.I've read this article from Intercom about feature creep. It is about over cluttered UI and what to do about it. I highly suggest you to read it. If you don't want to read it? Feel free to watch the video above. The Good : Pull Marketing Done RightIntercom.com did a great job in pulling me to their website and subtly giving me the hint that their communication solution could help me with my communication with customers. It gave me real value. This is why I'm sharing about it now. I think they did well linking their product to a problem faced by their target customers. Bravo! Intercom. The New The new thing that I've learnt today is the medical breakthrough that enables doctors to reprogram one type of cell into another type. The procedure takes a very short amount of time and is relatively safe and risk free. We are truly living in an age of advancements. For more information, check out the video below! It is good to see the person that you coach grow. I have been coaching my boss's kid for years and it's very good to see him grow from someone who needs a lot of pacing to someone who can persevere and find the solutions himself. It reminds us that we need to keep learning so that we won't be left behind. 1. Worker Responsibility - One will only do things that's instructed. Nothing more. Nothing less. This kind of responsibility is very popular during the industrial revolution because that's an age where there's only one best way to do something. Workers just need to follow and they'll be compensated by well they followed the instructions and how much they produced. 2. Professional Responsibility - This kind of responsibility is best explained with the example of a doctor. Have you ever cross check how your doctor work or is there anyone who is there to instruct them? No! This is because their work is immensely complex and specialized. They are responsible for the result regardless of what method that they used. For those of you who can understand Thai, please watch the video below. So which type of responsibility do you apply in your daily life?